CBS: Phoenix police said three people were injured in the Wednesday morning shooting at a Phoenix office building. Police are now searching for the shooter, authorities told ABC News. Washington Post: Television footage shows dozens of officers entering a building where police say people are injured. 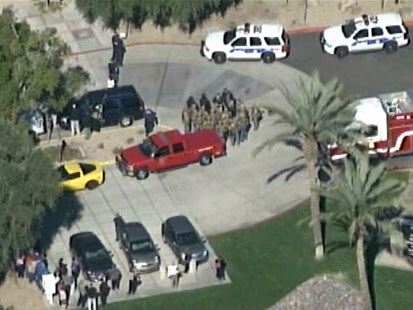 Phoenix police say injuries at office complex; multiple emergency vehicles at the scene. CNN: Former astronaut Mark Kelly referred to the shooting during a Senate Judiciary Committee hearing in Washington on gun violence. “There’s 50 or so police cars on the scene,” he said. NBC: Two or three other people were taken to hospitals for “stress-related” conditions after the incident at a complex near 16th Street and Glendale Avenue, authorities said. Authorities say at least three people were shot and several others were injured in a shooting Wednesday at a Phoenix office building.